Microsoft Powerpoint has been on the Internet for quite some time now. People who use this application make a common mistake of using too many slides with huge amounts of text and that is a major turnoff for the audience. Huge text is seen as a disaster. You should be able to convey an interesting story to your attentive audience without explaining every single detail on your slides for your presentation. Using a GIF to explain complicate things or just set it as a background can be much interesting. It allows us to instantly grab the audience's short attention span. It allows the presentation to answer a lot of preconceived notion from the audience with less words. It is a good guide to bring up a pressing issue. Keep it easy to follow along. Combine GIF images with your text together. There are many animated gif images on the internet, you can also make one by yourself. Wondershare Filmora is a powerful editing tools that allow you to convert video into GIF images, no matter what kind of video formats you got, including MKV, FLV, WMV, MP4, etc. You can also add advanced elements, animations, text, overlays to personlize your GIFs. There are three main methods on using Microsoft Powerpoint to your advantage when you are trying to insert a GIF image into your presentation. Select the Insert tab located at the top of the Powerpoint application. 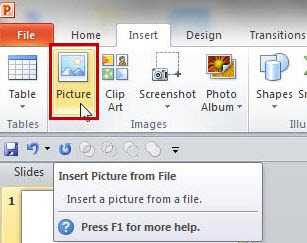 The next step is to select the Picture icon located in the Images ribbon area located also at the top of the computer window. Look for the image that you desire to add to the Powerpoint slide, then make sure to double click on the file to successfully insert your image. You also have the option to move the GIF image on the page by clicking and dragging the image to the location that you want to place the picture. A helpful step is to first locate your desired GIF image, using Control + C to copy it first. Then, paste your image on the Powerpoint slide by pressing Control + V.
You can also highlight the file name, and then use the drag and drop feature to put your image directly into the Powerpoint slide of your choice. The final method is to embed GIF images on the Internet into a Powerpoint slide. You can achieve this function by using the Insert Ribbon's Pictures icon. Select Pictures, then write in the image URL directly in the File input box. Then, select Insert. The Powerpoint application will download the GIF image that you selected into the current Powerpoint slide for your presentation. The GIF image is still available for you to access anytime if you are not connected to the Internet. It is due to being embedded. Here we recommend the method 1 and 2, the method 3 will take a little time while Powerpoint downloading the GIF picture. There are some important ways to customize your GIF images in the Powerpoint application. If you desire on changing the physical size of your GIF file or changing the appearance of the image, you can right click on your desired image and select Format Pictures. 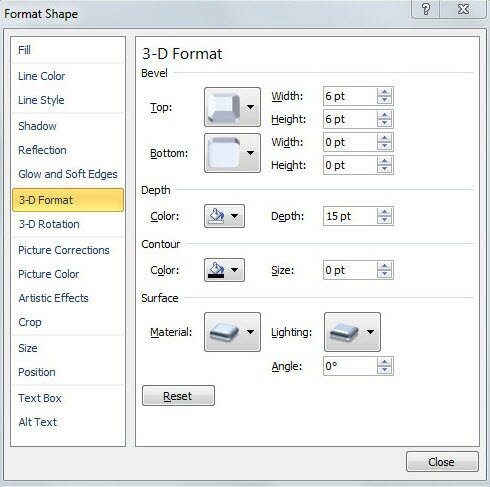 It will open up a brand new Format Picture window that will have a good variety of image editing menus at your fingertips at the left side of the computer window. There is a feature where you can change the brightness and contrast on your images by selecting the Picture Corrections icon. Experiment and have fun.